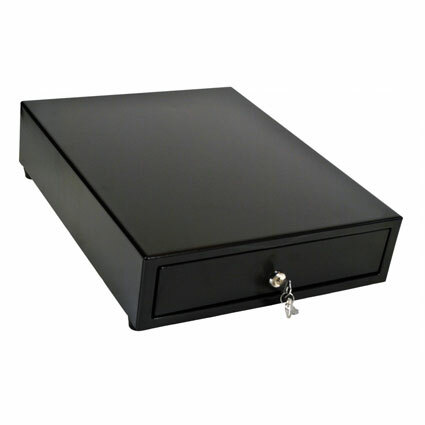 The M-S Cash Drawer EP-102N features a small footprint and versatility ideal for portable point of sale operations or locations lacking space. At 13" x 16.3", the EP-102N has one of the smallest footprints on the market. To create an easy installation, the M-S Cash Drawer EP-102N can be opened via receipt printer driver, USB, RS-232 Serial, or Parallel methods. If you´re looking for a compact and inexpensive drawer with a multitude of interface options, the MS EP-102N is a great choice. The EP-102N has a small 13X16 inch footprint, four bill, and coin slots and is available in serial, parallel, USB or printer driven interfaces. Lightweight and compact with optional under counter mounting brackets, this drawer would be great for low to medium volume applications where space is a big concern. Dimensions (WxDxH): 13" x 16.3" x 3.54"